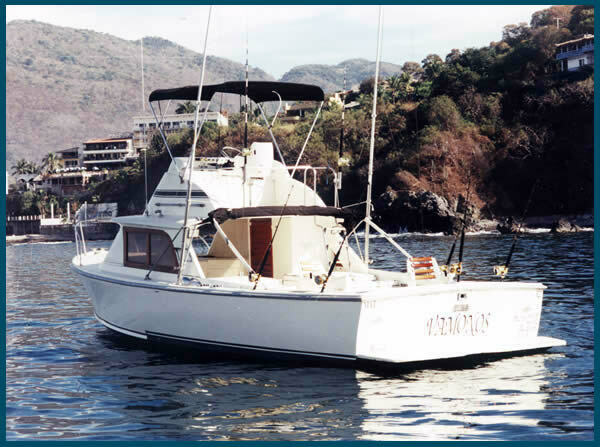 Vamonos I is a 31 footer fishing boat, with capacity for 6 anglers. Vamonos I with Captain Kaly (Calixto Juarez ) is a Bertram Fishing Charter, and is equipped with twin diesel motors, Penn Intenational Equipment, 6 fishing lines trolling at the same time & a down regal, shade cover, clean bathroon, GPS navigator, two fishing chairs, fisihing licences, bait, live well, ice chest with 20 Drinks on board , 8 hours of fishing, & transportation hotel-main dock in Zihuatanejo. 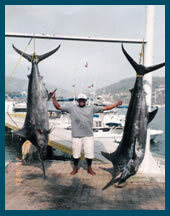 Vamonos I offers you fishing trips for Deep Sea Fishing, Small Game Fishing and Fly fishing in the Pacific Coast of Ixtapa/Zihuatanejo Mexico. All of our fishing captains on the Vamonos I, Vamonos II & Vamonos III have participated in many fishing tournaments in Ixtapa/Zihuatanejo & Lazaro Cardenas , Michoacan With successful results.